Sasse: Drain The Swamp. For Real. WASHINGTON, D.C. – U.S. 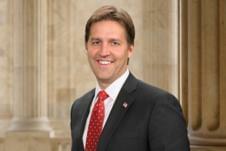 Senator Ben Sasse rolled out five ethics reform bills aimed at actually draining the swamp. 2. Require that presidential and vice-presidential candidates’ tax returns are disclosed. Voters deserve basic information about the financial situation of their potential chief executive. Make sure they can get it by requiring the IRS disclose candidates tax returns. 3. Create a public database of congressional HR settlements, make disclosure quicker, and increase personal financial liability for members of congress. Voters should be able to expect transparency from their representatives when accusations of improper conduct are settled. At the end of the day, giving constituents information is the best way to make sure that elected representatives are held accountable. 4. Prohibit members of Congress from buying or selling stocks during their time in office. Members of Congress are supposed to do what’s best for their constituents, not their 401K. 5. Put a stopper in D.C.’s infamous Revolving Door with a lifetime ban on members of Congress making money lobbying. Washington’s legislator-to-lobbyist pipeline is cutting out the input of families and small businesses who can’t pay to play. That’s wrong. Getting elected to the U.S. Congress should be honest work, not a lottery ticket.